Personalized 2x3.5 911 ambulance business card round corner full color magnets (20 mil) are good way to make your information stand out and to make yourselves available in times of emergency. Suited to all mobile ambulance services, hospitals, social service organizations, health organizations, health support groups. 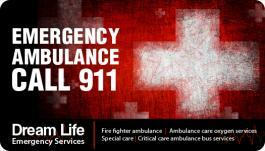 This promotional 2 x 3.5 911 ambulance business card magnet helps these services to establish their identity in front of a community in an effortless manner. Custom 2x3.5 911 ambulance business card magnets makes a good giveaway during routine health checkups, blood donation drives or it can be handed to a patient at the end of his appointment.